Finally! Back with a new finished project! So sorry for the long wait but you cannot rush these things and sometimes you just cannot get the inspiration or the will to knit, especially with other things going on in your life. 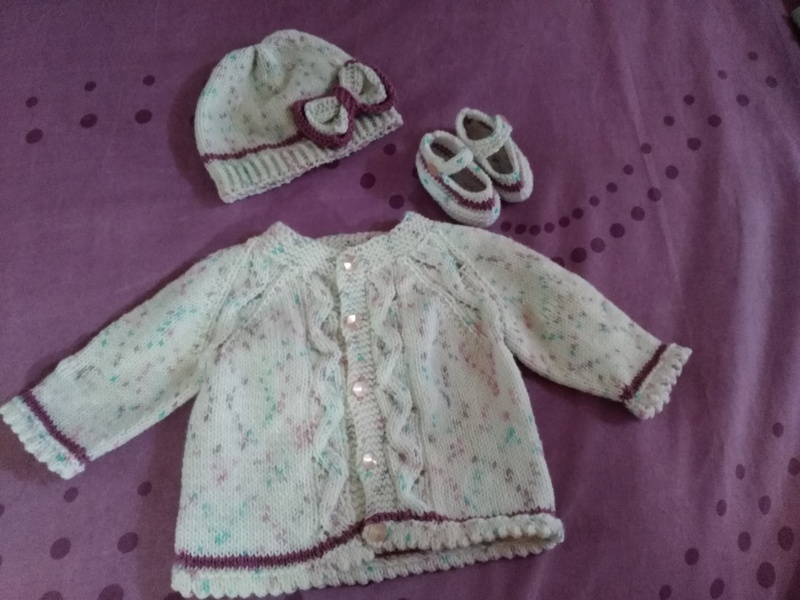 Anyway, I’m back with tons of finished items, but let’s just start with one for now 🙂 A baby set. So my cousin just had a baby a few weeks ago and before the little one was born, I thought I’d make her something small. At first I just thought of making a beanie hat from a pattern I’d already used before for a friend’s baby. I thought that would be perfect. So far so good. I found this pattern on Etsy. Unfortunately, the one I purchased (just the hat) is not available anymore. However, the seller has another pattern with the same hat and also some really nice booties. Me being the sucker for punishment that I am, I decided to make them in the end. I looked around on the internet for some easy baby booties and I really liked the Mary Jane-style booties. I easily found a free pattern and got to work. I adjusted this pattern also a little bit because I wanted to add the purple colour to match the entire set so I did a few stocking stitching instead of all knit. All in all, the entire set looks nice, don’t you think? 🙂 My cousin loved them when I presented them to her. That’s the most important thing.